Back by popular demand, you'll see an It Happened at the Coliseum every morning that the Islanders play this season at the Coliseum. I hope you'll enjoy this trip down memory lane that when it was originally produced raised over $32,000 for Make-A-Wish of Metro NY. The Isles will look to right that statistic tonight, when once again it will Happen at the Coliseum. 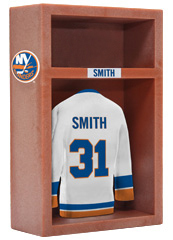 41 years ago tonight (1973) – Billy Smith was voted the game’s #1 star, but it wasn’t enough as the Isles fell 2-1 to Philadelphia before a sellout crowd at the Coliseum. Billy Harris had given the Islanders a 1-0 first period lead but Orest Kindrachuk and Jimmy Watson scored 1:16 apart in the second period to turn the game in Philadelphia’s favor. Smith finished with 30 saves. Ed Westfall led the Isles with six shots on goal. Also on this date: (2007) - Kari Lehtonen made 33 saves and Ilya Kovlachuk had the winning goal in the opening minute as the Atlanta Thrashers blanked the Isles 4-0. "It was an all-star goal," Islanders forward Mike Sillinger said. "We had all our coverage. He made a great move." All-time, the Isles have played five December 1st games at the Coliseum and have an 0-5-0 record on this date at 1255 Hempstead Turnpike in Uniondale.